YPS Valves Limited is a UK based manufacturer of stainless steel gate, globe and check valves to petrochemical plants, oil refineries, power generation plants (including nuclear) and off-shore sites. With a global client base that includes industry leading brands such as Shell, Esso, BP, Exxon Mobil, Sasol, Chevron, Ineos and Conoco-Philips, we have a reputation for manufacturing high quality valves and stocking one of the best ranges of valves in Europe. 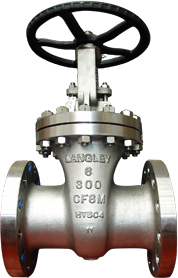 As a manufacturer and stockist we are able to offer clients a flexible service that encompasses special design and production facilities for clients requiring customised valves created from exotic materials, the modification of existing valve designs, and a broad choice of stock from other leading manufacturers such as Calobri, Velan, Neway and OMB. We source all of our materials through approved suppliers in the UK, Europe and USA who we assess to ensure they meet the quality of ISO9001.